Published on September 19, 2018 in Crime in T&T, General T&T, Kidnapping, Police and Security. 2 Comments Tags: COP, Crime in T&T, Gary Griffith, Raffique Shah, T&T Govt. Gary Griffith couldn’t have scripted a better opening act for his entry onto the national stage as the new Commissioner of Police, even if he were the Bard of Cascade or whatever suburb he lives in or comes from. After six years of play-acting by career police officer Stephen Williams, and amidst much intrigue, controversy and good old Trinidad bacchanal over the selection of a new CoP, which featured principal parts played by politicians of every hue and persuasion, not to add cameos by a significant number among the “extras” in the 1.4 million population, Gary landed the starring role—and what an entry he made. Published on September 30, 2016 in Crime in T&T, General T&T, Parliament, PNM, Politics, Security, Sports and Tourism. 12 Comments Tags: Budget 2017, Colm Imbert, Politics, T&T Govt. IN rolling out a series of money-making measures in the 2016/2017 National Budget, both the rich and poor were touched by yesterday’s Budget presentation. Published on September 28, 2016 in General T&T, Law, Media, Parliament, PNM, Politics, Security and UNC. 24 Comments Tags: Anthony Carmona, Edmund Dillon, Express, Hamid Ghany, Martin Daly. Additionally, he said, Italian Import/Export Limited, a registered local company and/or its directors, neither purchased nor imported any wine on behalf of the office of the President. Published on May 22, 2016 in Crime in T&T, General T&T, Law, PNM and Security. 1 Comment Tags: Abuse, Crime in T&T, Politics, Raffique Shah, SSA, T&T Govt. Really, it does not bother me that the Strategic Service Agency (SSA), or any other State intelligence agency, from the AIA to the ZIA, might want to peep through my back door, monitor what I am writing now, check my email before I do, or listen in on my telephone or family conversations at my home. I have long accepted that with the sophisticated technology available to them, indeed to anyone who might want to “macco” people, the privacy that we once enjoyed, or thought we did, has ceased to exist. Published on February 24, 2016 in Crime in T&T, General T&T, Law, Media, Schools, Security and Violence. 1 Comment Tags: Anthony Garcia, Chaguanas North Secondary School, Minister of Education, Newsday. 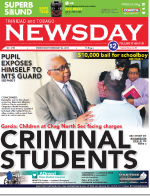 CRIMINAL students are among the population of the Chaguanas North Secondary School and Minister of Education Anthony Garcia, yesterday pledged to have them removed. As a start, Garcia revealed that 24 students — identified as ring leaders in the delinquency that has plagued the school — are to be sent home with immediate effect. Following a return visit to the school yesterday, this time along with Minister of National Security Edmund Dillon, Garcia told reporters, “I have taken a decision, a definite decision, that I will not tolerate indiscipline and violence in our schools. My mantra is no school indiscipline, no violence in schools.” Dillon also said the country may have to consider boot camps for delinquent students as Garcia said he will be looking at ways in which the students who are removed from the school could be reintegrated into the system. Published on April 19, 2015 in Crime in T&T, General T&T, Law, Police and Security. 14 Comments Tags: Abuse, Crime in T&T, Raffique Shah. Later that evening, when television footage showed police officers of varying ranks holding tens of thousands of law-abiding motorists and commuters hostage, trapped in scorching heat and toxic exhaust fumes with no chance to escape, I thought that by the following morning I would wake up to hear that scores of police officers had been suspended from duty pending investigations into their misconduct. Published on February 2, 2015 in General T&T, Law, Media and Security. 20 Comments Tags: Abuse, Anand Ramlogan, Crime in T&T, Gary Griffith, Kamla Persad-Bissessar, Politics, T&T Govt. PRIME Minister Kamla Persad-Bissessar has asked that the President revoke the appointments of Attorney General Anand Ramlogan, National Security Minister Gary Griffith, and called for the resignation of the Director of the Police Complaints Authority (PCA) David West, for their roles in witness-tampering investigation ordered by Acting Police Commissioner Stephen Williams. Published on February 1, 2015 in Crime in T&T, General T&T, Law, Media, People's Partnership, Security and UNC. 16 Comments Tags: Abuse, Anand Ramlogan, Crime in T&T, David West, Express, Gary Griffith, Politics, T&T Govt. “The standing of the Attorney General is not the only consideration Ms Persad-Bissessar is obliged to weigh. If, indeed, Mr Griffith had been aware of illegality even suspected of being engaged in or proposed by the Attorney General, he should not himself have waited until now to be exposed as someone in the know. His own fitness for office is now at least open to question. “Finally, that it has taken nearly three months for Mr West, a lawyer, to report to the relevant authorities some illegality he might have suspected is itself troublingly questionable. Published on January 30, 2015 in Crime in T&T, General T&T, People's Partnership, Politics, Security and UNC. 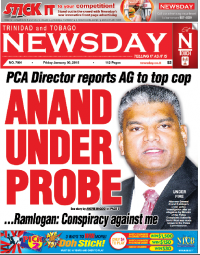 9 Comments Tags: Anand Ramlogan, Attorney General, David West, Kamla Persad-Bissessar, Newsday, T&T Govt. ACTING Commissioner of Police Stephen Williams yesterday announced that he had ordered a police probe into an allegation of an attempt to pervert the course of justice made against Attorney General Anand Ramlogan by Director of the Police Complaints Authority David West.